My daughter is one of those kids that can't fall asleep without a constant sound in her room. She's a lot like her mamma in that way. Ever since i can remember I was that way growing up too. I always had to have a fan running in my bedroom giving me that "white" noise in the background. Living in town it helped block out the sound of traffic and people walking down the sidewalks talking outside of our house. And to this day 365 days a year I still have that fan going for sound. My daughter isn't as into the fan noise as I am and actually likes "real" sounds as she calls them. I don't want her listening to music as I'm afraid it will keep her from being able to wake up to an alarm clock playing music later in life so I thought this was a better alternative. 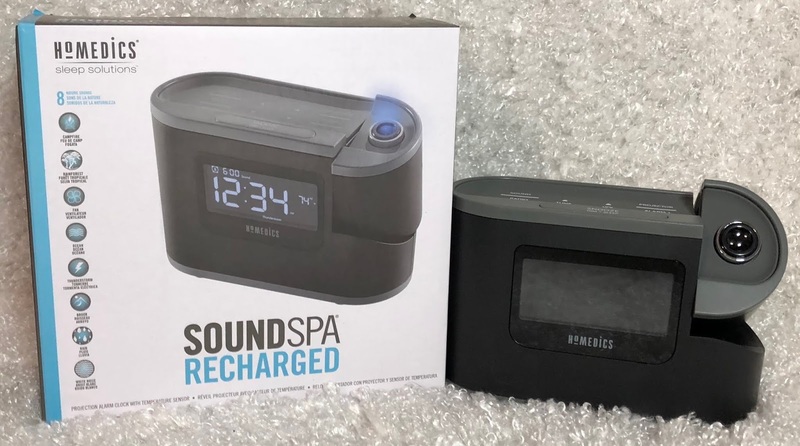 The HoMedics® SoundSpa® Recharged sound machine allows her to choose from sounds of nature instead, which she actually likes quite well. And it even has a projection clock that happens to work perfectly for her having a loft bed so she can easily see the time on her ceiling. So far it's worked out perfectly for her room, she sets the 60 minute timer before she climbs into bed and is off to sleep before it runs out. In the morning she is awaken by her choice of radio, nature sounds, or a beep tone (which she has to get out of bed to turn off). As a parent I love that it has a place built into it to hold her phone giving me the excuse that it's where she needs to leave it plugged in over night to charge. This is definitely the perfect all-in-one machine.